So there’s been another twist in the story of BICEP2 and whether or not it has actually detected primordial gravitational waves. This time it is a blog post on a site called Résonaances by Adam Falkowski who alleges that the BICEP2 team has made a pretty astounding error in their analysis of the data. This suggestion has been picked up by a couple of fairly influential science news sites (here and here). The BICEP2 team deny having made any such error and are quoted in the news stories defending their results in robust terms. Before I continue let me make it clear that I stand by the scepticism I have expressed on this blog about this result (which, in fact, is shared by many of my colleagues in the cosmology fraternity1). The problem is that the measurement is made at a single frequency (150 GHz) and it is by no means clear on that basis whether it has the black-body spectrum that would characterize it as being associated with the cosmic microwave background rather than some sort of foreground emission. At 150 GHz the major worry is that polarized emission from galactic dust might contribute significantly to the signal, and might even swamp any primordial contribution. To estimate polarized emission from the galactic dust, BICEP digitized an unpublished 353 GHz map shown by the Planck collaboration at a conference. 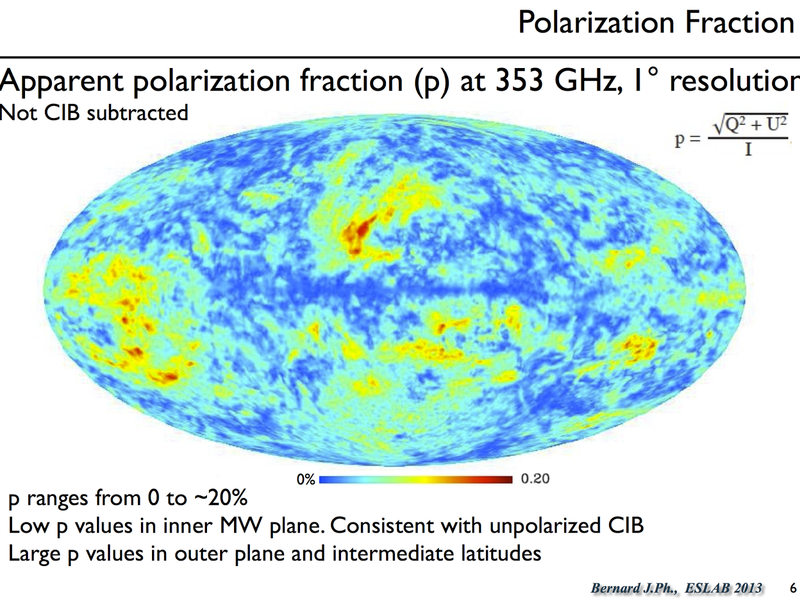 However, it seems they misinterpreted the Planck results: that map shows the polarization fraction for all foregrounds, not for the galactic dust only (see the “not CIB subtracted” caveat in the slide). Once you correct for that and rescale the Planck results appropriately, some experts claim that the polarized galactic dust emission can account for most of the BICEP signal. The point about this is that dust emission increases with frequency, so that at 353 GHz it would be expected to dominate the primordial cosmic microwave component. However, if one can measure the polarized component of this emission at high frequency (where it is larger and consequently easier to measure) then one could try to estimate the polarized contribution at the lower frequency measured at 150 GHz by BICEP2 by assuming it has a similar polarized fraction. This is actually just about the only way to estimate the foreground contribution. Unfortunately in this map there is an additional unpolarized foreground arising from the Cosmic Infrared Background (CIB) which comprised integration dust emission from extragalactic sources. Including this component makes the polarized fraction look lower than it would if it were separated out and only the more highly polarized Galactic contribution considered. In other words including the CIB leads to an underestimate of the polarized fraction and consequently an underestimate of the foreground contamination at 150 GHz. Did BICEP2 actually use this digitized image to estimate the polarized foreground for their experiment? Did they make the error of which they have been accused? Does this invalidate the BICEP2 announcement? The answer to (1) is that I don’t know for sure but it’s certainly possible that they did. It sounds a pretty ropey approach, but the Planck data are not publicly available so they had to improvise. Even if (1) is the case, I am not at all sure that (2) is true. They may have, but in their responses to the suggestion they have denied it. It seems such a silly error that I’d be surprised, but that doesn’t in itself make it untrue. However, even if (1) and (2) are the case that doesn’t mean that (3) is true, i.e. it does not imply that the entire analysis presented by BICEP2 is wrong. They have several different estimates of the foreground contribution using other methods so the entire result clearly does not stand or fall on the basis of the use of this particular map in a particular way. I repeat what I’ve said before in response to the BICEP2 analysis, namely that the discussion of foregrounds in their paper is disappointing. I’d also say that I think the foreground emission at these frequencies is so complicated that none of the simple approaches that were available to the BICEP2 team are reliable enough to be convincing. My opinion on the analysis hasn’t therefore changed at all as a result of this rumour. I think BICEP2 has definitely detected something at 150 GHz but we simply have no firm evidence at the moment that it is primordial. That will change shortly, with the possibility of other experiments (specifically Planck, but also possibly SPTPol) supplying the missing evidence. I’m not particularly keen on the rumour-mongering that has gone on, but then I’m not very keen either on the way the BICEP2 result has been presented in some quarters as being beyond reasonable doubt when it clearly doesn’t have that status. Yet. Rational scepticism is a very good thing. It’s one of the things that makes science what it is. But it all too easily turns into mudslinging. Note: 1 I use the word “fraternity” in the sense given in the Chambers Dictionary as “any set of people with something in common” rather than as “an all-male N American college association”. Cosmology is neither “all-male” nor exclusively American and I did not mean to imply either by my use of English. This entry was posted on May 14, 2014 at 5:26 pm and is filed under The Universe and Stuff with tags Bicep2, Cosmic Microwave Background, Cosmology, Primordial Gravitational Waves. You can follow any responses to this entry through the RSS 2.0 feed. You can leave a response, or trackback from your own site. Indeed. Of course this is (at least) the second BICEP rumour – the first one being that they *had* detected primordial GW. Good stuff Peter. Thanks for all this. It’s good to know that cosmology has not descended into straight-to-press hype and multiverses after all. My attitude towards BICEP2 hardened when I started reading about “proof of the multiverse”. Now I think back to Steve Eales’ Origins where he was somewhat critical of “high powered theoretical physics”, and my attitude towards inflation has hardened too. Amazingly, what this comes down to is taking various Planck conference talks, digitizing the data on some images, guessing a few details of how the images were made, and recovering an estimate of the unpublished Planck data in the BICEP region. Even more amazingly, it seems that this is what the BICEP people did. But they made different assumptions in their reverse engineering and got a lower answer. All the time, Planck knows the truth, but they’re saying nothing – what a state of affairs. Still, for now, and given the level of detail in what Flauger has done, I guess we have to put the BICEP result into limbo until we hear from Planck. I hope they move fast: the present situation is intolerable. Did BICEP ask Planck for that data? If not, why not; if so, what happened next? Planck is a large collaboration with a very strict policy on what is and what is not allowed to be shared. Interestingly though two members of the BICEP2 team are also members of the Planck collaboration…. And I’m sure that they couldn’t possibly comment. But yes, the two groups have to talk and fast. It claims that BICEP2 asked Planck for data in their region of the sky, but the request was refused. At the risk of stating the obvious, John, I’d say that the present situation in the Ukraine is something that would count as “intolerable”. On the other hand, the tension between the BICEP2 result and what-the-Planck-team-may-or-may-not-yet know-based-on-their-ongoing-detailed-processing-and-careful-analysis-of-their-full-dataset-ahead-of-the-scheduled-October-release is something that I suspect The Real World(TM) can live with for a tad longer. And surely even within the world of cosmology, it would be for the best if the Planck team make sure that when they do put out something on this, it’s as rock solid as possible. Well of course you’re right: a great many people in the world live pretty horrible lives, and spending Planck-style quantities of money sorting out abstract issues about the origin of the universe would hardly be at the top of their priorities. We should never forget how privileged we are to lead nice lives with the luxury to be concerned with such matters. And I hope mostly I do manage to be appropriately grateful. But interest in the universe is a great human universal: everyone has stood at night, looked at the stars and wondered. So it’s not just for an elite that sorting out BICEP matters. Agreed, Planck had long-term plans, and it must be annoying to have to deal with BICEP as a distraction from these. But we’re talking about a once-in-a-century discovery here (or not). What seems to be at issue is a factor 3 in the level of background at 150 GHz, and you’d think Planck data should be good enough to decide on that quite rapidly, even if it takes longer to reach the ultimate accuracy. Or even issue a short note saying “we can’t yet give a verdict, for the following reasons”. Otherwise, we’ll just see months more of this technically impressive but ultimately amateurish digging around in whatever PDFs can be found on the web. It’s not going to make the subject look good. Although Planck wasn’t really designed for polarization, this was included and Planck will have their own results on polarization, perhaps even detecting the B-modes themselves. They might want to publish their own polarization result first, rather than help the BICEP2 folks steal their thunder. What a pile of hot air. It’s just embarrassing how seriously you people take yourselves. I find not a little guilt because most of you are so deluded and credulous. Your comments have degenerated into crude and ill-informed abuse. Kindly desist or I shall be forced to ban you. Somewhere in the multiverse, right now, in one bubble universe, there is a discussion about scientists who have used an instrument called BICEP2 who claim to have discovered primordial B polarisation. However, there is doubt about the amount of polarised dust they have deduced from a slide showed in a conference. In that bubble universe data from a satellite called Planck will later show that the measured polarisation all came from dust and that r is much less than 0.1. Somewhere else in the multiverse, right now, in another bubble universe, there is also a discussion about scientists who have used an instrument called BICEP2 who claim to have discovered primordial B polarisation in their universe. Also for them, there is doubt about the amount of polarised dust, which they also have deduced from a slide showed at a conference. In that bubble universe data from a satellite called Planck will later show that the measured polarisation really was primordial, that the contribution from polarised dust was subdominant and that r is 0.1. Do you actually think such adolescent speculations make you appear profoundly thoughtful? I do not know which is more execrable, that professionals are themselves utterly deluded, or that they suffer amateur commentary such as this in the name of fairness. I don’t understand how there remains any question of whether they (BICEP2) did or did not hitch their wagon to this data from the Planck slide … I thought we were taught in first-year science how to write a complete methodology section, or is this optional in cosmology papers? To my knowledge no BICEP2 papers have yet been accepted for publication; I hope whoever the referee is, that person will demand a proper description of the foreground analysis. Which, if any, of the criticisms are in refereed papers? This is a scandalous situation that calls into question (as if that were needed) the entire subject of cosmology as actual science. I refer you to your nemesis, Mike Disney, a man of mental means who can call a spade a spade. When you have digested Disney, then meet Cooperstock. More on BICEP2 and whether its results are correct or not. Great post Peter. It does not surprise me that Planck are keeping quiet, the detection (or not) of this B-mode polarisation is such an important result that it is understandable that the Planck consortium want to analyse their own results as carefully as possible before saying anything. They of course have the huge advantage of all sky coverage *and* 7 frequencies, so one would assume they can do a much better job of foreground subtraction than BICEP2 were able to do. I am a little surprised that BICEP2 used a “guesstimate” based on a Planck map presented at a conference to get a (better?) handle on the foreground emission at their single frequency of 150 GHz, and even more surprised that this is not thoroughly discussed in their paper. As you say Peter, any referee worth his salt will require a very thorough discussion of their foreground analysis methodology to be presented in any published paper. Even if it takes another 4-6 months for Planck’s analysis to come out, that is not *that* long in the grand scheme of things. Geez, I still have unpublished papers from observing runs in the 1990s sitting somewhere in my office!